To add more excitement for the eventful days ahead, Nintendo of America President and COO Reggie Fils-Aime has posted a welcome video for E3 on Nintendo's official YouTube channel. 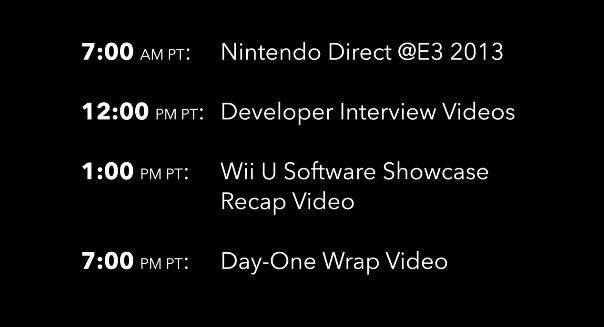 The video details when the Nintendo Direct broadcast will take place — 11th June at 3pm UK time / 4pm European Central time / 10am Eastern / 7am Pacific, in case you've missed it — along with content such as gameplay videos, trailers for new games and developer interviews. Over on the company's official Facebook page, another video was posted featuring Fils-Aime giving us more information about Nintendo's plans for the event, paying particular attention to why the company avoided a conference and opted for a Nintendo Direct presentation instead. "We're always looking for new ways to surprise and delight", said Reggie on the topic, and although this is the case, we'll be receiving information on upcoming games and releases like we have been in previous years, so nothing has really changed in that sense. 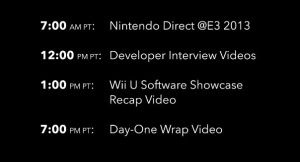 You can keep an eye on Nintendo's Facebook, Twitter and YouTube feeds for all information fresh out of E3. We'll naturally be covering the event for all your needy ears and eyes, so be sure to stick with us over the coming week. Reggie looks confident... and has he lost wait maybe his body is finally ready? That's just the first day schedule? Can someone tell me the correct time for Mexico City (GMT-6)? Anyway, my body is ready. Anybody else notice that Mario is holding a GamePad in the background? Anyway yeah I kinda freaked when Reggie came running into my Wii U home menu...I'm SO excited for Tuesday! I can't wait to see what Nintendo has in store!!! I'm afraid it looks like more of a 3DS to me. Is it just me, or does it look like Reggie dropped 20 lbs/10kg. I guess his body really is ready for this E3. The problem with E3 is that it's an industry conference for media. Nintendo are cutting out the middleman and going straight to the public. @net34a GMT is UK, so GMT-6 should be 9 am. Thanks for listening and reporting back Reggie i hope this becomes an abitude for Nintendo, i mean been always in contact with us. It won't play on my kindle, so it maybe a while before I watch it. The reason why it cannot play on my device is because it has no Flash Adobe Player. I am expecting a great amount of hype in the video, though. E3, will drive WiiU sales, And make those games not coming to WiiU seem irrelevant. I predict 2014's E3, alot of 3rd party publishers will be trying to rebuild burnt bridges with Nintendo and Nintendo fans. At least they arn't alienating fans left and right (Microsoft) or just doing the same old crap they always do (Sony). Guys, you're feeding the trolls. @Blizzaga your right, I'll delete my message and ignore. Yeah I kinda did to.. thanks for catching that @Blizzaga. I just don't understand why people want to be so negative and make people dislike them. @Fusion14 Are you serious sony is still at e3 no? Man I can't wait till Tuesday! Many potential great games coming out this year for 3ds/WiiU plus the thought of a few more "secret" games has me anxiously awaiting the E3 Nintendo Direct. Wow. I never thought I would read something so naive. You proved me wrong. Just wait until E3 and the PS4/Xbox One consoles launch before jumping to conclusions. Let's hope Nintendo floors us with their upcoming Wii U games.